24 Jun 2013: We formally created a model for bulk sales as our ‘Sponsor-a-school campaign/programme’. 27 June 2013: We workshopped a marketing plan with Zoom Advertising (who gave us most of a day of their top execs’ time pro bono), and fleshed it out over July and August into a marketing plan that forms the foundation of our efforts for the next 12 months. 1 Aug 2013: We created and implemented a Facebook conversation plan for Paperight Young Writers’ Anthology. This meant creating several posts for every week, including beautiful graphics, scheduled to publish for the next six weeks on Facebook, all promoting the anthology. You can see the posts on our Facebook page. 5 Aug 2013: We revised our rightsholder agreement, which was received with no negative feedback, and even a nice endorsement from top tech journalist Adam Oxford. 8 Aug 2013: We officially finished Software Development Phase 3. This was a big update that included support for VAT-compliant invoices and statements. (See Dezre’s post on VAT.) It’s not glamorous, but massively useful and important for us, and it was really hard work. 30 Aug 2013: We created a simple tillpoint checklist for stores. It was hard to do. The simplest things can be the trickiest to make. 28 June 2013: I spoke at the Education Week conference in Joburg, arguing that open-license publishing has more in common with commercial publishing than most think. 4 Jun 2013: In a blog post, I argued that it’s a myth that reading is dying among young people. 26 June 2013: I spoke at Khayelitsha Chamber of Commerce meeting on the need for technology entrepreneurs to focus on simple solutions that solve today’s problems (not tomorrow’s). We’ve entered into an exciting collaboration with copier manufacturer RISO, where they bundle a funded Paperight account with every colour printer sold to a South African school. This gives us a powerful mechanism to engage with large schools and colleges, a simple message for the media, and a great tool for getting certain key publishers on board. 1 June 2013: The Gapp, “Minuteman Sponsors matric class at Silverstream Secondary School”. 1 June 2013: On Route, “Home grown stories”. 6 June 2013: SAfm, Interview with Oscar on Morning Talk with Ike Phahla. 11 June 2013: booksloveyou (blog), “Prizes, poetry and Paperight: this week in African publishing news”. 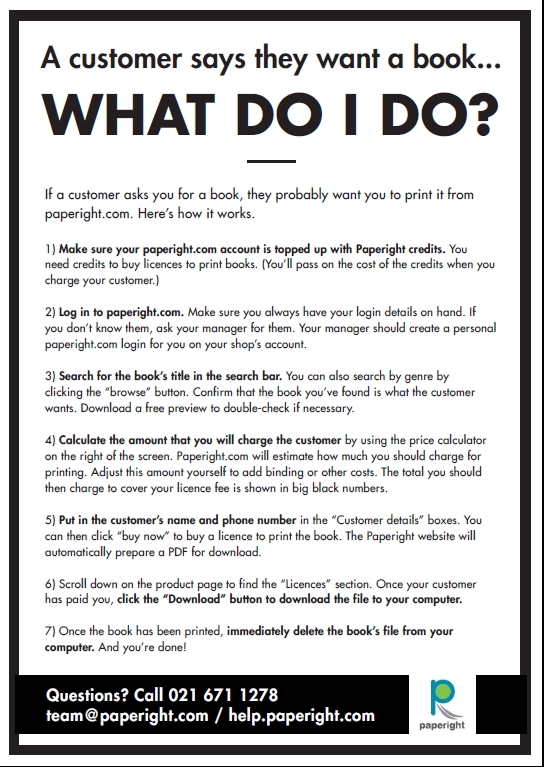 13 June 2013: Magellan Media Consulting Partners blog, “Putting books in places they’ve never been sold before”. 15 June 2013: The Oppidan Press, “Youth literature anthology launches”. 19 June 2013: Kaya FM, Interview with Oscar on Breakfast Show with Bob Mabena. 19 June 2013: The Witness, “Anthology of young writers’ work”. 20 June 2013: Knysna Plett Herald, “Home-made stories”. 1 July 2013: Elle, “Read a Book SA”. 3 July 2013: CNN Opinion, “10 African tech startups you need to know”. 18 July 2013: Startups FM, “Paperight cracks the code to bringing education to the developing world with its Print on Demand publishing platform”. 20 July 2013: Beeld Naweek, “Hou die uit SA dop”. 1 Aug 2013: Education Southern Africa, “Education Southern Africa”. 1 Aug 2013: Graphix, “School receives much needed material”. 7 Aug 2013: Bloemfontein Courant, “Nasionale prestasies vir OMS”. 8 Aug 2013: Eikestadnuus, “Paperight Young Writers’ Anthology 2013”. 28 Aug 2013: ITWeb, “Paperight, Riso Africa empower schools to print their own textbooks”. 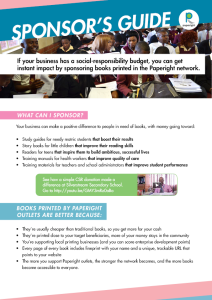 28 Aug 2013: StartupsFM, “Paperight and Riso Africa empower schools to print their own textbooks”. 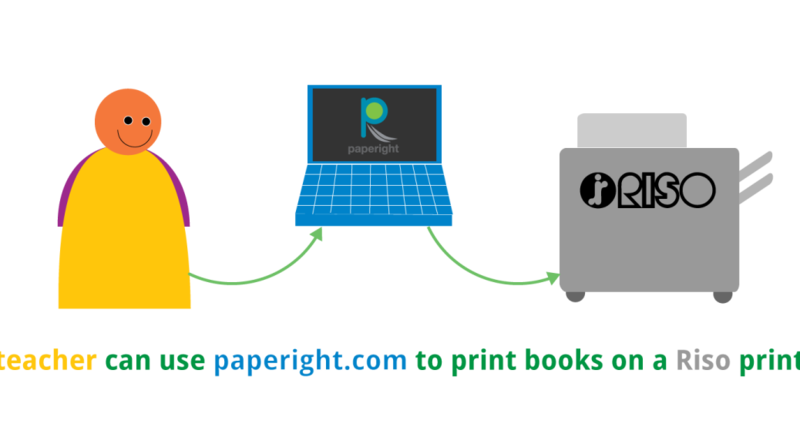 29 Aug 2013: TechMoran, “Cape Town’s Paperight.com & Riso Africa Partner To Allow Schools Print Their Own Textbooks”. 29 Aug 2013: Ventureburn, “Paperight partners with copier-printer developer Riso to empower schools”. Our revenue targets are getting serious, so the focus is on bringing in bulk sales, mostly through getting sponsorships. We’re recruiting a salesperson, but meanwhile (and perhaps beyond), I’m going to focus more of my time on this, and delegating other responsibilities to the team. We have a few more software updates to do: most minor but important tweaks, and one major addition: a much better, fully integrated outlets-finding maps, integrated in the UI with product pages. Get our video production stream up and running with new full-time video intern. You can browse an archive of Paperight content and promotional material on Dropbox here.